Disinfection systems can be installed in a building’s plumbing to minimize Legionella bacteria in the water delivered to faucets, showers, and drinking fountains. Commonly used technologies inject a chemical (the disinfectant) into the water supply shortly after it enters the building, into the hot water system at or near the water heaters, or into both. Disinfection systems have been in the spotlight recently because Legionnaires’ disease was identified among patients of a VA hospital in Pittsburgh even though it had disinfection equipment (copper-silver ionization) installed in its plumbing. News stories have included comments suggesting the hospital had been using an ineffective disinfectant or had failed to maintain equipment, quoting health officials and consultants about the effectiveness of copper-silver versus chlorine or other disinfectants. I do not sell disinfection systems or in any way profit from recommending one over another. I don’t have a favorite, either. Having reviewed Legionella test results before and after the installation of various disinfection systems—and for some buildings monthly or quarterly results for several years afterward, observing the effects of operational, maintenance, and piping changes—I cannot conclude that any one of the disinfection technologies currently available is the best choice for all buildings. For most projects, if I recommend a disinfectant at all, I choose among five of them, weighing a number of factors. In addition to track record, I consider the chemistry of the public water supply, Legionella test results for the hot and cold water, safety of storing and handling the chemicals, plumbing system materials (metallurgy), intended duration of the disinfection (short term or long term), EPA and state regulations, age and fouling of the plumbing system, health effects from exposure to the disinfectant and its byproducts, corrosiveness of the chemical, availability and capability of the onsite crew to handle the maintenance, and initial and ongoing costs. a. The disinfection equipment must be properly selected, sized, and controlled. 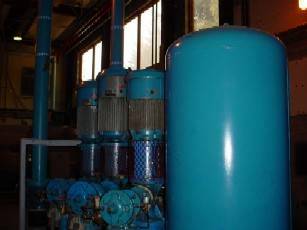 The equipment must be able to generate the amount of chemical required for the peak demand, considering both the water consumption and the quality of the incoming water supply. Just as important is the ability to control the dose delivered relative to the same factors, which can be pretty tricky. For some disinfectants, equipment efficiency and reliability can vary significantly from one maker to another. b. The chemical must be injected at the right locations. If it isn’t, you will get too much in some areas and not enough in others, and might also spend more money than necessary on chemicals. Vendors vary in design expertise. Select one that has had success in planning and designing the same type of disinfection system in plumbing systems similar to yours in size, use, and complexity. c. The disinfection equipment must be operated and maintained well. Simple as that sounds, it often does not happen. In July and August alone, disinfection systems at a hospital with an excellent facilities staff were found to be off during most of the vendor’s weekly inspections. Some weeks the unit was off because of a failed part—electric cell, analyzer sample chamber, temperature switch, fitting, tubing, solenoid valve, low-flow alarm, or GFI outlet. At other times it was off because the facility personnel or a contractor turned it off and forgot to turn it back on. Sometimes it was off for no apparent reason. Expect to have problems and questions. Choose a vendor that has the experience, willingness, competence, and availability to help you with training, service, and problem solving after the installation. d. The entire plumbing system must be properly designed, operated, and maintained. Even if the disinfectant is injected at the optimum dose, it will not be successful in controlling Legionella unless it reaches all parts of the plumbing system. The building operator’s Legionella HACCP water plan must include operation and maintenance procedures to ensure the disinfectant has a chance to be effective. Some hospitals have found that flushing procedures carried out (or not) by the environmental services (housekeeping) crew are especially important. Thankfully, disinfection technology is available to control Legionella in nearly all plumbing systems. With any disinfectant, proper design, operation, and maintenance of the disinfection equipment and the entire plumbing system are crucial for success.